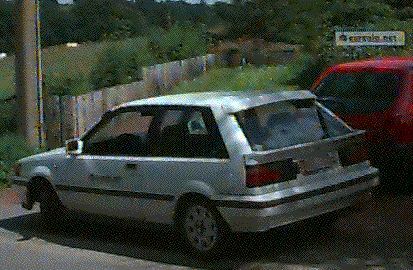 Here are some old, low quality pictures of my first car. Sometimes, I wish I had that car again... It was fast and a lot of fun to drive, although quite expensive for spare parts... 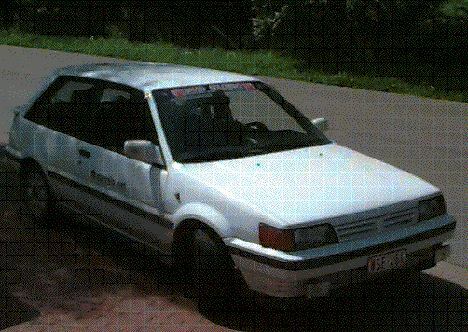 I owned the Sunny from August 1994 until March 1999 and drove 130,000 km with it during that time. 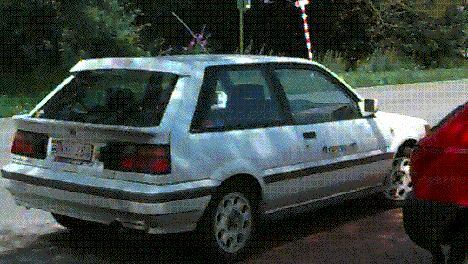 It was almost sold to an Australian friend who wanted to get a rallye car with left-hand steerig. However shipping costs were too expensive. A man was driving along the highway, and saw a rabbit hopping across the middle of the road. He swerved to avoid hitting the rabbit, but unfortunately the rabbit jumped in front of the car and was hit. The driver, being a sensitive man as well as an animal lover, pulled over to the side of the road and got out to see what had become of the rabbit. Much to his dismay, the rabbit was dead. The driver felt so awful he began to cry. The woman told the man not to worry. She knew what to do. She went to her car trunk and pulled out a spray can. She walked over to the limp, dead rabbit, and sprayed the contents of the can onto the rabbit. Miraculously, the rabbit came to life, jumped up, waved its paw at the two humans and hopped down the road. 50 metres away the rabbit stopped, turned around, waved at the two again, hopped down the road another 50 metres, turned, waved, and hopped another 50 metres. The man was astonished. He couldn't figure out what substance could be in the woman's spray can! He ran over to the woman and demanded, "What was in your spray can? What did you spray onto that rabbit?" It said: "'Hare Spray' Restores Life to Dead Hare. Adds Permanent Wave"